Payment schedules of the Multiple Payment kind are to be used when you want to split up the balance by a certain number of payments across the period of time between the booking date and the job/session date, and the final payment will be due no later than 1 month before the job date. 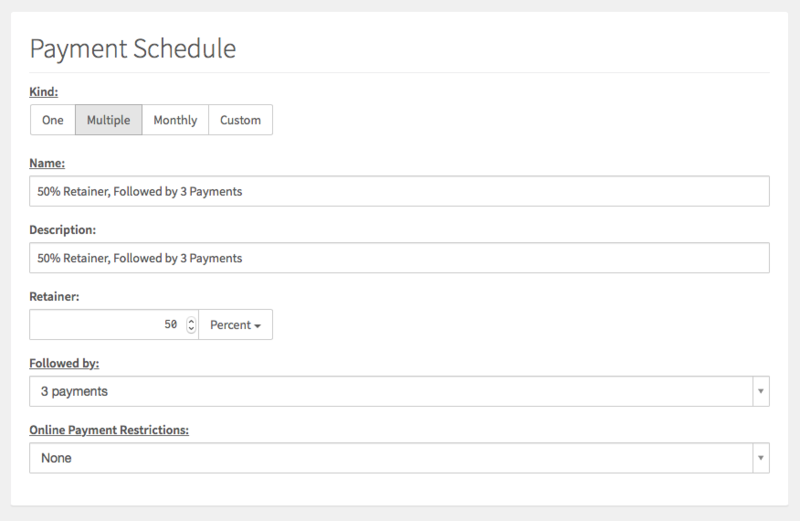 After naming your multiple payment schedule and adding an optional description for your reference, you can set a Retainer percentage or fixed amount if you wish to require a designated amount to be paid at the time of booking. Then, you’ll simply choose the number of payments you’d like the order’s invoices to be split into in the Followed by dropdown.